Lotharingia was created out of the Middle Frankish kingdom of Lothar I, and eventually became a satellite state, and later duchy of France. 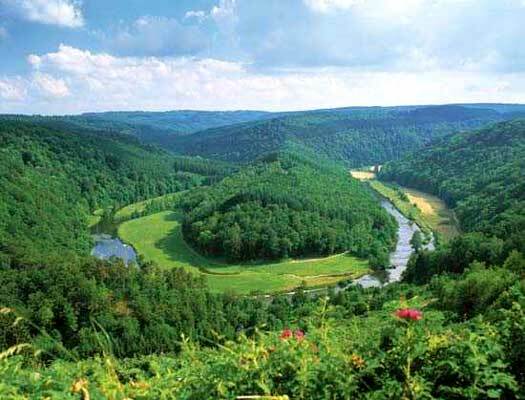 It included territory which later emerged as the county of Luxemberg. Initially it was ruled by Lothar I as a constituent part of Francia Media, which included all of central and northern Italy (the territory of the former exarchate of Ravenna and the kingdom of the Lombards), and the Rhine corridor up to the modern Netherlands, which also included Switzerland. The imperial city of Aachen, Charlemagne's former residence, was included in this territory. However, this greatness was ephemeral. Lothar's death in 855 at Prüm Abbey signalled its division under the Frankish practice of partible inheritance. His territory, which had never really bonded into a single entity thanks to its very different cultural backgrounds, was divided relatively equally between his three sons. 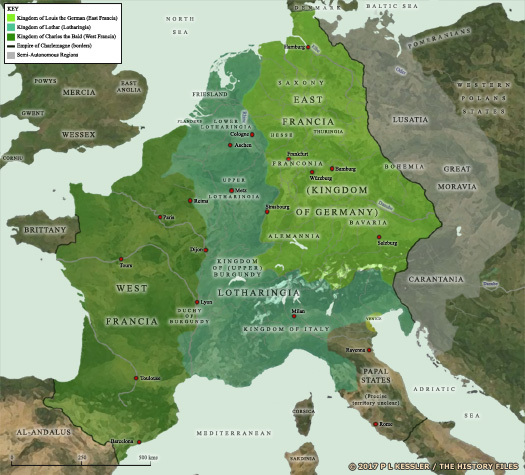 Lothar II received Lotharingia, an amalgam of the Rhine corridor territories between Burgundy and the Low Countries. Son of Lothar I, king of Italy. Also king of Burgundy & Provence. Following the death of Lothar, his territory is divided fairly by his uncles under the terms of the Treaty of Meerssen (or Mersen). Those uncles are Louis the German of the Eastern Franks and Charles the Bald of the Western Franks. In 880, Lotharingia is incorporated into the nascent Germanic Roman Empire thanks to the Treaty of Ribemont. A period of confusion begins in 895/6 when the German king hands Lotharingia to his illegitimate son. A charter records that Nanther, dux in 'Orientali Francia', and his wife Kunigund make a donation to Kloster St Saturnin at Münsterdreisen. This lies in the modern Rheinland-Pfaltz region, and seems to be close to the western edge of what is becoming Franconia at this time, but seems more likely to be at the south-eastern edge of Lotharinga. Illegitimate son of Germanic Emperor Arnulf. Duke of Franconia (?) & Lotharingia. Count in Hessi lands. Gebhard of the Hessian Wetterau (also known as Gebhard of Franconia) is confirmed as duke of Lotharingia by Louis the Child, king of Germany, in 903. He is killed in 910 in battle against the Magyars, somewhere in the region of Augsburg. His eldest son is Herman, who becomes duke of Swabia in 926. His younger son succeeds him as count of the Wetterau (from 914) and succeeds Eberhard, duke of Franconia, as count of Oberlahngau (presumably in 918). Local noble. Transferred allegiance to Western Franks. With the accession of Reginar Longneck of the Maasgau on the lower Meuse, Lotharingia becomes a Western Frankish satellite state. Reginar himself (possibly no more than a commander in Lotharingia for Charles the Simple) is a direct ancestor of the landgraves of Hesse from the sixteenth century through the male line. His own son becomes Reginar II, count of Hainaut (890-932), and the line descends through the counts of Leuven in the tenth to twelfth centuries, and then through Brabant to reach the first landgrave of Hesse, Henry of Brabant (son of Duchess Sophia of Thuringia - who establishes the landgraviate - and her husband, Henry II of Brabant). Charles had been deposed in the west in 923. Reginar's son, Gilbert, aligns himself with the Eastern Franks once more, and governs Lotheringia in the name of the East Frankish German king. Son of Reginar. Son-in-law of Henry I of Saxony. Died 939. Upon the death of his ally, Henry the Fowler, Gilbert rebels against his successor as king of Germany, Otto I. Instead he swears allegiance to Louis IV d'Outremer of the West Franks. Gilbert rules Lorraine (or Lotharingia as it is still sometimes known, using the old form of the name) almost as an independent state for the next three years. The rebellious dukes Gilbert II of Maasgau, duke of Lorraine, and Eberhard of Franconia loot the counties of Udo IV of the Wetterau (or Odo) and his nephew Conrad of Niederlahngau, both Hesse lands. Their force is so large that Udo and Conrad are unable to resist them. But then the rebel dukes re-cross the Rhine at Andernach on 2 October in order to return to Lorraine and Udo and Conrad take the opportunity that has been presented to them. The Battle of Andernach takes place with Gilbert and Eberhard still on the east bank of the Rhine and the bulk of their forces already across. Udo and Conrad attack and defeat them, killing Eberhard while Gilbert drowns when trying to escape. Their deaths allow Otto I, king of Germany, to restore order and show his favour to Udo. He succeeds Conrad as count of Niederlahngau in 949. Son-in-law of HRE Otto I. Great-grandfather of Conrad II. Brother of Otto I of Saxony. Archbishop of Cologne. Duke of Upper Lorraine (975-978). 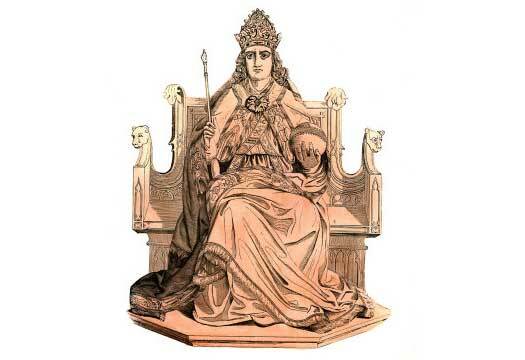 With the accession of the Saxon king, Otto I, the power of the Germanic Roman empire is confirmed. Otto is quite vigorous in establishing new counties and border areas within and without the empire's borders. The county of Ardennes under Sigfried gains the stronghold of Lucilinburhuc (the later Luxemburg, at the moment within Lotharingia), Arnulf I the Elder is restored in Flanders, and the March of Austria is formed (or confirmed) from territory already captured from Hungary (around 960). The duchy is split between Upper and Lower Lorraine. Grandfather of Godfrey of Bouillon. Duke of Lower Lorraine (1023-1044). Became duke of Lower Lorraine (1065-1069). Upon the death of Giselbert of the stronghold of Lucilinburhuc, his son Conrad succeeds him as the first confirmed count of Luxemburg, taking it permanently out of the direct control of Lorraine's dukes. Brother of Thierry, count of Flanders. Son. Duke of (a single) Lorraine from 1190. Brother. Duke of Bitsch (Northern Lorraine). Simon's mother has been intent on gaining the duchy for her second son, Ferry. Simon asserts his own claim and becomes duke despite her, but the growing dispute had not been ended. In 1178 it turns into civil war which is only mediated by Count Philip of Flanders in 1179. Agreement is reached in the resultant Treaty of Ribemont whereby the duchy is divided. Simon retains the southern, French-speaking section while Ferry gains the northern, German-speaking section, with the addition of Gerbéviller and Ormes. Despite swearing to act as his brother's vassal, Ferry takes the title 'Duke of Bitsch' (or Bitche), which despite only being a county expresses his intent to retain equal status. This is the name of a citadel and small town which now form part of the Moselle département in Lorraine, on the very north-eastern edge of France. The title of Lower Lorraine passes out of use once the dukes of Brabant gain it. The region evolves into part of the Low Countries that goes into forming the modern Netherlands. Effectively, Upper Lorraine is the only surviving duchy of Lorraine. The area that formed Lower Lorraine included Breda, Antwerp, Brabant and Aix-la-Chapelle. During the conquests of Julius Caesar the land between Breda and Antwerp had provided a home for the Ambivariti tribe, and later the Toxandri. Son of Louis V of France. His claim to the crown was ignored. By this time the Carolingian kings and those drawn from the House of Paris have so weakened the effectiveness of the monarchy in France that it owns little land outside Paris. The Carolingian son of Louis V, Charles the Carolingian, duke of Lower Lorraine, is ignored in favour of passing the crown permanently to the House of Paris under Hugh Capet. Charles struggles to regain 'his' throne, but he is captured and imprisoned, and dies in Orleans. Became duke of Upper Lorraine (1033-1044). Former duke of Upper Lorraine (1044-1047). Margrave of Spoleto. Lower Lorraine passes to the dukes of Brabant, who cease using the title ('Lothier') in 1190, so the duchy ceases to exist as a separate entity. The region evolves into part of the Low Countries that goes into forming part of the modern Netherlands. Upper Lorraine survives, now the only duchy of Lorraine. The duchy of Lorraine evolved out of the Carolingian kingdom of Lotharingia. In 975 it was divided into 'upper' and 'lower' territories. The area that formed Lower Lorraine included Breda, Antwerp, Brabant and Aix-la-Chapelle, but this passed to the dukes of Brabant in 1100. They ceased to use the duchy's title ('Lothier') in 1190, so Lower Lorraine ceased to exist as a separate entity. Instead it evolved into part of the Low Countries that went into forming areas of the modern Netherlands. Upper Lorraine was the sole surviving bearer of the name, and after 1190 it could drop the prefix of 'upper', becoming the sole duchy of Lorraine. The dukes of (Upper) Lorraine since the tenth century had been supplied by the House of Ardennes-Bar (959-1033) prior to the creation of the county of Bar, and Ardennes-Verdun from 1033. The first duke of a single Lorraine was Simon II, who had been forced to assert his rightful claim to the title in the face of his mother's wish to have her second son, Frederick, obtain the title instead. This he did, and was also forced to create the 'Estates of Lorraine', an early form of parliament, and cede certain rights to his subjects. 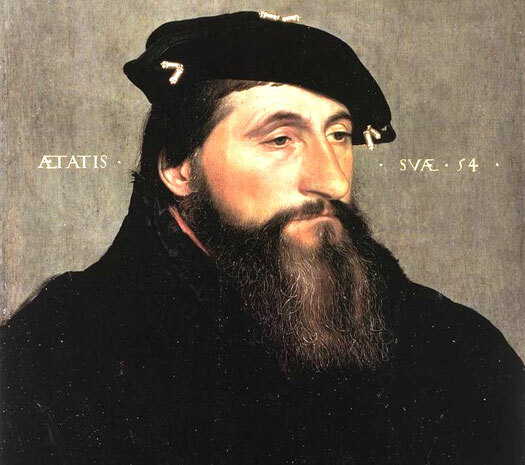 Amongst his successors were several bearing the name Ferry (the French diminutive of Frederick - the French names for the early dukes seem to dominate the German forms, a legacy of its later pro-French history). These dukes are also often shown as the Germanic Frederick, with their numbering restarted from scratch despite there already having been two Fredericks (of Upper Lorraine). Ferry II is usually accepted as such, but when taking into account the earlier bearers of his name (in its German form) he could be Frederick III, IV, or even V.
Duke of Upper Lorraine (Southern Lorraine) (1176-1190). Having gained lands in Luxemburg as a result of his marriage to Ermesinde of Namur, Count Theobald I of Bar is now also granted the county of Vaudémont by Simon. Following the civil war in 1178-1179 between Simon and his brother, Ferry, Upper Lorraine had been divided between the southern, French-speaking section and the northern, German-speaking section, with the addition of Gerbéviller and Ormes. Despite swearing to act as his brother's vassal, Ferry had taken the title 'Duke of Bitche', which expressed his intent to retain equal status. Now Simon abdicates without having produced an heir and the duchy is reunited under Ferry, as agreed in the treaty. Simon dies the following year having retired to a monastery, and is survived by his brother by no more than a further year. Ferry II goes to war against his father-in-law, Theobald of Bar, count of Luxemburg. He is defeated and captured and is imprisoned for seven months. In order to obtain his freedom he is forced to hand over Amance, Longwy, and Stenay, lands which he had gained thanks to his marriage to Agnes of Bar. Essentially, Theobald wins back his daughter's dowry. Son. No heir. Died largely broken by his defeats. In a conflict which is vital to the French monarchy, from 1202 the 'War' of Bouvines involves John of England, HRE Otto IV, and also Thiébaut on the one side, and Philip II on the other supported by Otto III of Burgundy. The culmination is the Battle of Bouvines on 27 July 1214. The French are victorious, while John loses the duchy of Normandy and his other French possessions. Thiébaut is taken prisoner during the rout but is freed soon afterwards. When the Fifth Crusade (Second Expedition) is decreed, HRE Frederick II is excommunicated both for not taking part and then for going and negotiating the possession of Jerusalem (until 1244). He is accompanied on his expedition by Matthew II of Lorraine amongst others. Ferry III marries Margaret, daughter of Theobald I of Navarre, count of Champagne. The union spells the start of a process of increasing Gallification in Lorraine, but this results in tension between the duchy's French and German influences. Holy Roman Emperor Adolf is killed at the Battle of Göllheim, near Speyer, whilst fighting his rival, Albert of Habsburg in Austria. Unusually for the dukes of Lorraine, the soon-to-be Duke Thiébaut II is present at the battle on the side of Albert. When Louis IV (Louis the Bavarian) is elected German king in 1314, a minority faction elects Frederick the Fair of Habsburg as emperor. Louis defeats Frederick in 1322 at the Battle of Mühldorf (in which Frederick's supporter, Duke Ferry IV of Lorraine, is also captured). Ever keen to exploit a situation which can strengthen his own influence over Lorraine, Charles IV of France quickly manages to have the duke released on the promise that Lorraine will remain impartial in future imperial affairs. A peasant revolt in Flanders forces King Philip of France to fight the Battle of Cassel, thirty kilometres south of Dunkirk, bringing the revolt to an end and bringing Flanders fully under French control. Supporting the king, Duke Ferry IV of Lorraine is killed during the fighting, while Duke Odo IV of Burgundy is wounded. Mother and regent. Daughter of Albert I of Germany. Replaced. Father-in-law to Rudolf and regent. Shipwrecked and killed. King Philip of France confiscates Gascony from Edward III of England so the English invade France to press their own claim to the French throne. The Hundred Years War begins, with the fiefdom of Aquitaine part of the spoils to be won or lost. In 1346, Edward crushes Philip's army at the Battle of Crécy, killing Duke Rudolf of Lorraine amongst many others. Son. Acceded aged 6 months. Fought with Teutonic Knights. Mother and regent. Daughter of Guy I of Blois. Count of Württemberg. Future father-in-law to John. A hesitant and clumsy king, John II of France is taken prisoner by the English at Poitiers during a conflict with Philip, brother of King Charles the Bad of Navarre. Duke John I of Lorraine fights at the king's side and survives the virtual massacre of the French nobility. Son of John I. Numbering continued from Lower Lorraine. After having fought at Tunis in 1391, Charles is one of the participants at the Battle of Nicopolis. It results in defeat for the allied European forces with the result that the Bulgars are conquered and occupied by the Ottoman Turks. The Teutonic Knights conquer the duchy of Samogitia, removing it from Lithuanian control. Their dream of uniting their Prussian lands with those of Livonia and Courland has become a reality. However, the Samogitians refuse to surrender. Ever the adventurer, Duke Charles is with the knights around this time, aiding them in their conquests. Husband and joint ruler. Duke of Bar. King of Naples (1435-1442). The claim to the kingdom of Naples passes to René I, with Isabel his queen consort. By 1442 Alfonso V of Aragon and Sicily conquers the territory and reunites it as a single southern Italian kingdom. René and many generations after him continue to claim the title for Lorraine. Duke following the death of his mother. Titular king of Naples. Aunt. John's sister. Duchess of Bar (1480). m Ferri II of Guise. Upon the death of Nicholas of Anjou, the duchy of Lorraine passes to his aunt, Yolanda, the sister of the late Duke John II. She immediately passes all of the duties and responsibilities of the title to her son, René (her husband, Ferri/Frederick II, count of Vaudémont, had died in 1470). When she inherits the duchy of Bar upon the death of her father in 1480, she repeats the act. The dukes of Lorraine also continue to claim the kingship of Naples. Son. Shared power although the title rested with Yolanda. As duke in fact if not directly so in title, René is facing increasing pressure both from Louis XI of France and Charles the Bold of Burgundy. He has already allied himself with Charles, but Burgundian garrisons have been established in Lorraine so René now switches allegiance to Louis. Charles invades Lorraine, forcing René to abandon Nancy on 30 November 1475. The city is recaptured on 5 October 1476 before René leads an army of Swiss mercenaries into the Battle of Nancy on 5 January 1477. Charles is defeated and killed, ending the Burgundian Wars. Succeeded mother upon her death. Duke of Bar. Count of Guise. When the duchy of Burgundy reverts to the French crown, Luxembourg passes to the Austrian Habsburgs. René of Guise conquers the prévôté of Virton, part of Luxemburg lands, and annexes it to the duchy of Bar which he also holds (and for which he is formally invested in 1484). Mother and regent during Anthony's absences for campaigns. The French invade Milan again, this time under Francis I. Victorious at the Battle of Marignano, they capture and imprison Massimiliano, and Francis I personally assumes the title of duke. The French have various allies assisting them, including Duke Anthony the Good. The French are again driven out of Milan, now by the Austrians under Holy Roman Emperor Charles V who installs Francesco II Sforza as duke of Milan. His brief tenure is ended, again by a French occupation, although probably without Anthony who has returned home. The Protestant Reformation is gathering pace, but Anthony deals with it firmly in his lands, supporting Catholic good order. The duchy of Lorraine has gradually established itself as an important and largely independent holding during the course of the previous century or so. Since 1525 it has remained neutral in the ongoing conflicts between France and Germany whilst remaining staunchly Catholic in the face of the Protestant Reformation (and therefore an important and 'legal' voice in European politics). The Treaty of Nuremberg on 26 August establishes Lorraine's legitimate independence as a 'free and non-incorporable' protectorate of the Holy Roman emperor, transforming it from an imperial fief as long as it pays certain imperial taxes. The idea is that Lorraine will protect the empire's western border against French intransigence. Son. Died after a brief period, leaving duchy in his wife's hands. Mother and regent. Daughter of Christian II of Denmark. Son of Charles III. Bore no sons in two marriages. Daughter. 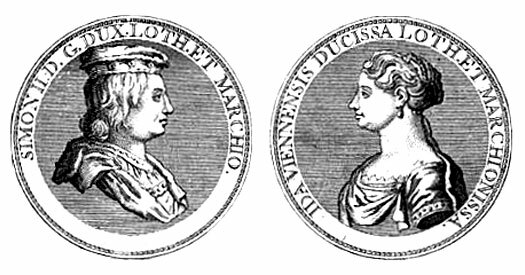 m Charles IV and became duchess consort. A potential succession dispute rears its head when Francis, count of Vaudémont, protests Nicola's position as duchess of Lorraine based on the fact that the succession must first progress through all potential male heirs. Lorraine's noble assembly, the States-General, feels that the claim is reasonable, so Francis becomes duke. Just five days later he abdicates the title in favour of his son, Charles. The latter has already managed to remove any right of his wife to hold power, leaving him as undisputed duke of Lorraine with an increasingly estranged marriage. Brother of Henry II. Count of Vaudémont. Died 1632. Son. Husband of Nicola. No children. Abdicated. French influence in Lorraine is becoming ever stronger, despite the intentions in 1542 of the Holy Roman emperor to use it as a buffer against France. King Louis XIII pressures Charles into abdicating in favour of his younger brother after having supported an opponent of France, Gaston d'Orléans, in his attempts to destabilise Richelieu's controlling hand in French politics. Sister of Nicola. Wife of Nicholas II. As soon as Nicholas succeeds as duke, France invades Lorraine as part of the Thirty Years' War and forces him to sign a treaty which acknowledges France's right to occupy the duchy. Nicholas then flees his lands and returns the title to his brother who is himself unable to return until 1661. The long French occupation of Lorraine lasts for much of the century and pushes the dukes closer to the Holy Roman empire. Restored thanks to his brother. Returned in 1661. The Fourth Austro-Turkish War ends in the Battle of Saint Gotthard on 1 August 1664 in which the Ottomans are defeated by Austrian troops under Raimondo Montecuccoli (with a company of 140 men being led by Count Herman Adolph of Lippe-Detmold and also the exiled future Duke Charles V of Lorraine in Imperial service thanks to the continued French occupation of his lands). The Ottomans are forced to agree to the Peace of Vasvár with Austria. Son of Nicholas II. Lived & died in exile due to French occupation. John III of Poland and Duke Charles lift the siege of the Austrian capital at Vienna on 12 September, ending Ottoman expansion in Europe by drawing a metaphorical line in the sand. Son. Acceded aged 11, in exile. Returned in 1697. The Treaty of Ryswick draws to a close the Nine Years' War, otherwise known as the War of the League of Augsberg. It stipulates that Spain must formally cede the western third of Hispaniola to France, while Lorraine is handed back to its rightful rulers, ending over half a century of French occupation there. Duke Leopold returns to his capital at Nancy, and makes good the repairs to his battered duchy. By the end of his life it has been fully restored to its previous level of prosperity. Spain is involved in the War of Succession as Austria, Britain, and Portugal dispute the Bourbon accession. Lorraine is occupied during the war, forcing the ducal court to flee. The conclusion of the war sees Spain giving up Milan, Naples, Sardinia, and the Spanish Netherlands (modern Belgium) to Austria, and Sicily to the duchy of Savoy. The Papal States are forced to hand over the territories of Parma and Piacenza to Austria, a definite blow to the papacy's prestige. Philip, duke of Anjou, is recognised as the Bourbon King Philip V of Spain, but only on the condition that the Bourbon crowns of Spain and France can never be united under a single ruler. The heir to the duchy, Leopold Clement, is about to be sent to Vienna as part of his education. An outbreak of smallpox kills him at Lunéville and his place in Vienna is given to his younger brother, Francis Stephen. Francis also later marries Maria Theresa, the Habsburg heiress and becomes, in time, Holy Roman Emperor Francis I. Son. HRE Francis I (1745-1765). m Maria Theresa Habsburg. The Polish War of Succession erupts between 1733-1735, in which Stanislas Lesczynski is supported by his son-in-law, Louis XV of France and Philip V of Spain. France grabs Lorraine, fearing that its pro-Habsburg bias will see it used as a base from which to attack France itself. The fighting ceases in 1735 and is concluded by the Treaty of Vienna in 1738. It stipulates that Stanislaw Lesczinski will receive Lorraine in settlement for being deposed as Poland's king, while Francis receives the grand duchy of Tuscany in compensation for the loss of his family's ancient lands. 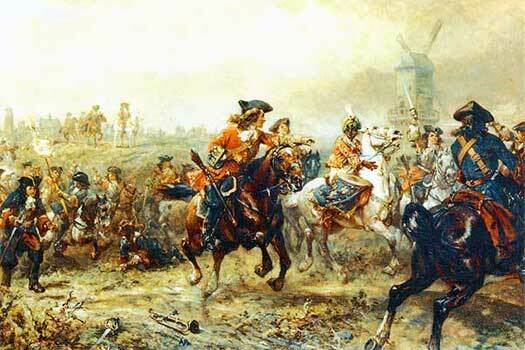 In the settlement of the War of Polish Succession, 1733-1735. Daughter. Heiress of Lorraine, married to Louis XV of France. Although Stanislaw Lesczinski is only granted the duchies of Lorraine and Bar for his lifetime, his eldest-surviving daughter, Marie Lesczinska becomes the heiress of Lorraine upon his death. She is already married to Louis XV of France, so the French crown is finally able to claim Lorraine as its own territory, ending its existence as an all-but independent duchy on French borders. The duchy's borders at this time largely correspond to Lorraine's modern borders.